I was recently asked why I created and so frequently use the term ''Autism Household'' to describe my family. 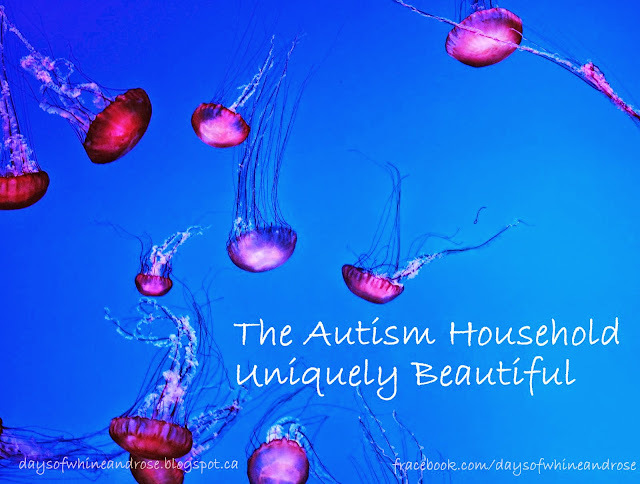 I thought it was time to talk about just what an ''Autism Household'' is. In writing about my journeys through this thing called life, I found that the A-Word seemed to take precedence. No, not precedence. It completely took over. And frankly, it bothered me. Because it seemed, no matter HOW I tried to describe everyday occurrences, I had to explain that my 20 year old son Eric is Autistic. Even if I was talking about taking out the trash. Because when you throw Autism into the mix, it DOES affect everyone and everything in the home. Including taking out the trash. It is not ERIC who makes things challenging, it is the way Autism presents itself in him that makes our life so different from the ''Norm'' (whatever THAT is!) By constantly referencing ERIC as AUTISTIC I felt that I was accentuating his challenges, rather than celebrating all the wonderful traits he and my entire family have. I realized that Autism doesn't just affect the person with the diagnosis. It changes just about every aspect of family life. So for us, and many many more out there, we do not have a child with Autism, we live in an Autism Household. What an Autism Household is NOT is a place for pity. Or for the timid. That doesn't mean we don't complain. Everyone does. We just complain about different things than most parents. I'm sure this will come as a surprise to those of you NOT in an Autism Household, but its not all bad. The thing I hear most often from those not familiar with life in an Autism Household is ''How do you manage'' or ''You must be so strong''. Well guess what. I manage because they are my children. They don't come with handbooks. No course prepares you for being a parent, no matter what challenges your child does or does not face. But when that tiny baby first flutters inside you, and you hear that heartbeat, feel the kicks, something happens. You change. You don't know it, but you do. Your basic survival instinct, formed deep within your DNA, switches from ensuring YOUR survival to ensuring YOUR CHILD'S survival. You love without condition, and protect without thought. When that child is born, and that squirming, squawking bundle of incredible joy is placed in your arms, you begin the journey. The journey of becoming the parent THEY need. It is not something we are taught, at least not in a formal way. It is something we grow into, just as our child grows. As we discover each other, and each other's needs. So each and every one of us becomes the parent that each and every one of our children needs. It is all we know. How to be a parent to OUR children. I only know how to be a mom to my boys, just as you only know how to be a parent to your children. I do whatever I have to for them, wussing out is not an option. That is not strength. That is love. And Love is a pretty strong force. Loving someone, as unconditionally as you love a child, takes away the option of walking away saying ''This is not what I expected'' ''This is Too Hard''. Love lets you feel and say those things, but fight even harder to get through the trials and make it work. Just ask any parent of a teenager. family, ridiculing their sibling or parent on a regular basis. And from that learn that there are many people out there who SEEM nice, but aren't. They learn to become incredible judges of character. They mature emotionally very quickly, and are often the most responsible people you will ever meet. They have to be. Their sibling often requires so much care that they have to learn very early how to be self-sufficient. And they learn how to help. They learn to look after their sibling, who may even be older than they are, and they learn how to ACCEPT. How to view the world through the eyes of one who is open to all people, compassionate to a fault. So no, they are not like their peers. And that is something to be proud of. Thanks to life in an Autism Household. Even pets take on new personalities when they are in an Autism Household. Our dog Teddy would run after Eric anytime he 'wandered' from the house. When Teddy died it was the first time I saw Eric emotionally hurt. He understood, in his own way. ''Teddy broken'', and still, 10 years on, will see a picture and say ''Teddy. Eric sad''. I am grateful my son misses our dog. That sounds like an odd thing to be grateful for, but I am..I had often thought, if I died, would Eric know I was gone? Would he miss me. I now know he would. 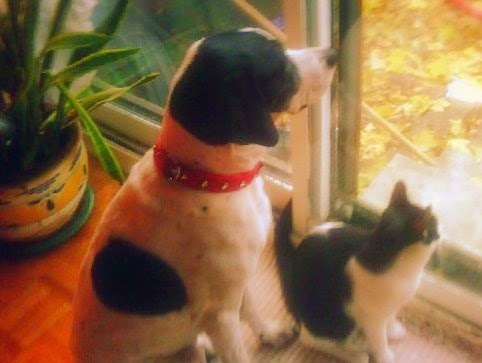 Susie, our pointer, was always at Eric's side. She was his protector. No one taught her this. She just knew. And then there was our cat, Chi Chi. Well, if you ever had a cat you know they don't put up with ANYTHING. Eric would routinely cradle Chi Chi in his two big hands, hold him up beside his face, just in his peripheral vision, and SLOWLY move Chi Chi down, screaming "AHHHHHHHHHHH" ala Mufassa falling into the gorge in The Lion King. this would take about 1.5 seconds. Then he'd start again. Over and Over. Chi Chi would tolerate for a good hour before gently jumping down. Pets KNOW. An Autism Household looks different too. Usually, thanks to the propensity to wander, there are locks on the INSIDE to prevent people getting out. There are picture symbol covered bristol boards everywhere describing routine or HOW to do something, even in the bathroom ( I won't elaborate). There are dedicated drawers with emergency binders. There are "sensory toys" and weighted blankets and DISNEY VIDEOS EVERYWHERE. There are locks on fridges and measures taken to prevent intentional flooding in sinks and toilets. There are rewards and distractors and compression vests and wine for Mommy. There are fights and noises and jumping and more jumping and things falling off walls from jumping. But most of all, there is love. You will never find a greater bond than the one formed within these walls. That is why I don't refer to us as a family with a child with Autism. We are an Autism Household.